Join the discussion on our forums! Come discuss Prismatic Lens over in our dedicated Prismatic Lens discussion topic. Draw a minion and a spell from your deck. Swap their Costs. Mined exclusively from the dark side of the moon. If this thing draws a Bomb it doesn't swap costs. I'm pretty sure it is a bug. Interesting design but I'm sceptical. Building a deck centered on this card means to include it twice to make the deck more stable. But it also decreases its potential, because, you may draw the 2nd Prismatic Lens! Dinosize seems to be the only big spell that could be relevant. either big dudes and cheap spells: if you draw it very early it might work even if you run this card twice (just include enough low-mana cost spells to increase the probability to get a favorable combo). If you can cast the Prismatic Lens early, your cheap big minion could hold the board an deal significant damage, a bit like an early Edwin VanCleef. 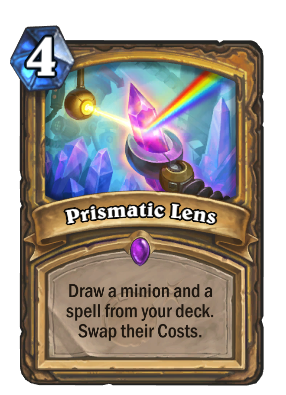 It wouldn't be the end of the world to get a second prismatic lens because you could just cast it again for 1 (theoretically) mana. Right. And so the second Prismatic Lens could become worth if you were unluck with the first one. design for swapping low cost spell with high cost minion, it can draw itself. 4 mana + draw is actually pretty prohibitive. Hammer of Wrath hardly sees play and it can actually effect the board state. That means this is probably only going to see play in control heavy decks where a thinned deck has more controlled outcomes and you are more likely to be able to play a potentially discounted spell or minion on the turn it's used. But when you think about cards you want in a control Paladin deck you think of things like consecration + equality + doomsayer...those seem like they would be bad targets for this spell. So it's starting to feel restrictive in theory crafting a good use for it. In a quicker deck like Even Paladin wasting turn 4 or 5 to do nothing but draw is bad and offers way too much breathing room for decks like Taunt Druid to stabilize against you. 4 mana is prime real estate in all versions of Paladin. It competes with a lot of other great cards like Consecration and a control deck trying to use this probably has consecration on auto-include which actually is a bit counter-intuitive because I don't think there's many minions you'd be alright with swapping to 4 mana. Edit: Maybe some kind of aggro variant can do shenanigans like put a lot of low cost minions in the deck along with Dinosize (making it 1-3 mana) and you can turn 5 Dinosize onto a Stonetusk Boar or something, but again a fast deck like that does not want to spend turn 4 doing nothing to the board state. We have yet to see the rest of the expansion and of course we have no idea how the new meta is going to settle in so like many others trying to theorize how good a card is I'm probably completely wrong. I'm just having a hard time seeing how it's going to be real useful outside of a few insane highlight reels. That might be really good for expansive minion + cheap spell combo. well, 4 mana draw 2 that tutors a minion and a spell? If you draw e.g. Into Argent Defender and Blessing of Kings, and you wanna play both it really doesn't matter which one costs which, but I find it really funny to draw into Argent Defender and Spikeridged Steed and Steed a Tirion. All in All a Draw 2, Really. Wait which card is Argent Defender? You mean Righteous Protector, Argent Squire, or Argent Protector? no he meant protector, since he said "and you wanna play both". 4 mana draw these 2 cards and 2 + 4 is the remaining 6. You better be ready, my secret paladin's one mana C'thun is here, and he comes with a vengeance, or a Bronzebeard explorer rather. Got a ten mana repentance ready to counter the next Pyroblast too. This is... wow, this is a weird and unexpected card. Sure Paladin has a lot of inexpensive spells and one cost secrets, but if the mana difference is too high that could result in a dead, overly expensive card. Still, the potential is there and this could create some really wacked out combos.